While the system are powered with UPS and other electric power generating system when no power or electricity, contemporary days, technology traveling forward here is process that traveling unique taking it source from earlier technology. 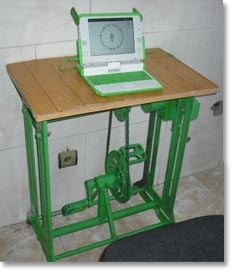 but now you can charge the laptop while using it by connecting a hand crank to a pedal, a prototype machine built by team of OLPC Afghanistan. You can work with laptop by sitting in the desk keep pedaling to generate electricity.